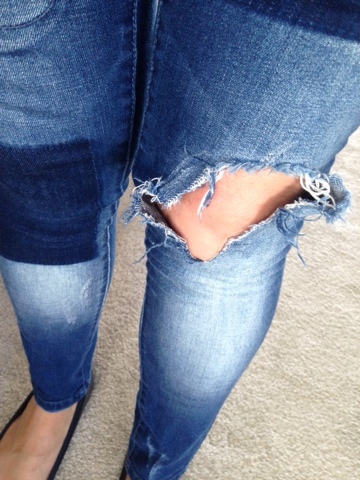 I'm a lover of distressed jeans but the rips can be so hit and miss - rips that look cool when you're standing can be deeply unflattering when you sit down! Equally when you're a busy mum, you find yourself bending and kneeling lots, meaning that the rips can become bigger over time. Inspired by this, I decided this week to regenerate a few other pairs in my wardrobe. First up, a recent purchase I got in the Gap outlet at Junction One for just £11. 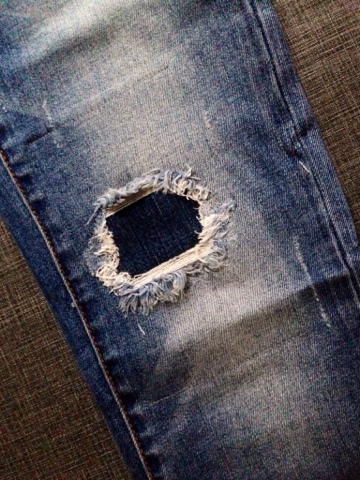 They have their rips a few inches above the knee so they were particularly awful looking when I sat down. But the fit was good otherwise (I find Gap jeans really great for fit) and I liked the colour. 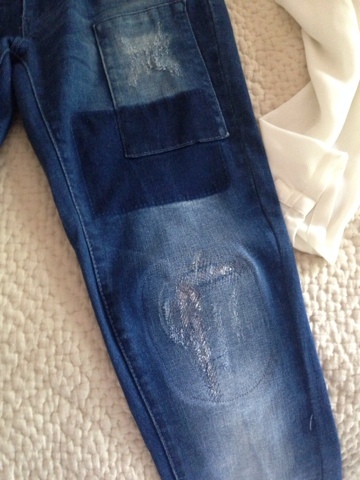 Next, another fairly recent addition to my wardrobe, my Vero Moda jeans, already had patches underneath the rips but they all peeled off after one wash, which was disappointing as these had become favourite jeans of mine. 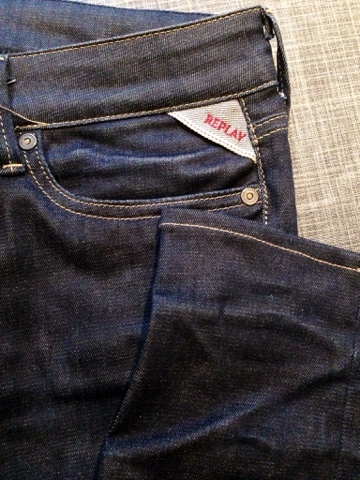 Lastly, my Replay skinnies are a fab fit but they were just a bit too long. Over the winter, this wasn't a problem as I cut them and wore ankle boots to cover the hemline. However, I've not been able to wear them all summer as the ends are a bit tatty from my less than perfect scissor action. 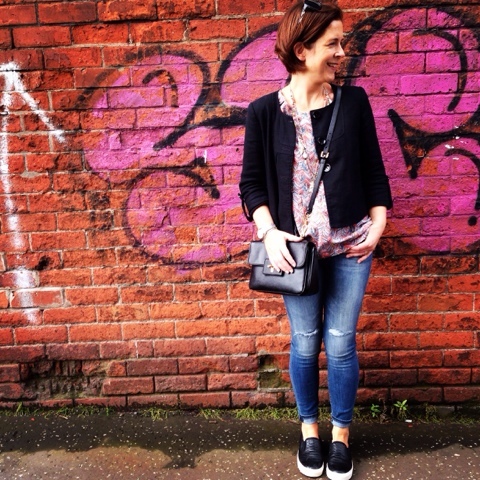 I brought all three to The Zipyard this week and had extra large patches put into the Gap and Vero Moda jeans and a hem put on the Replay ones. Because I chose large ones, each patch was £6 but I felt that was well worth paying because not only do they sew around the perimeter of the patch, the team there also sew around the rip itself. It's a double securing of the weak point and as I've found with my Only jeans (which I had patched back in May and have worn lots since), those patches aren't going to budge easily. 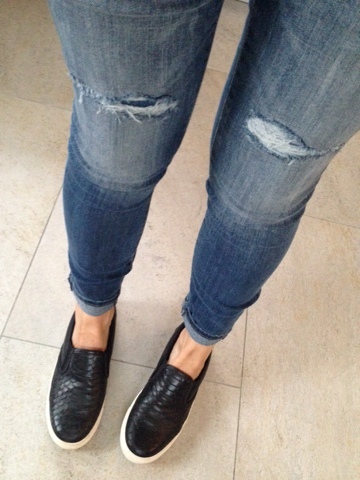 It got me thinking that perhaps you might like the look of ripped jeans but feel they are too revealing so this could be a good option to still get the effect without having to tan random parts of your legs (I have actually done this). 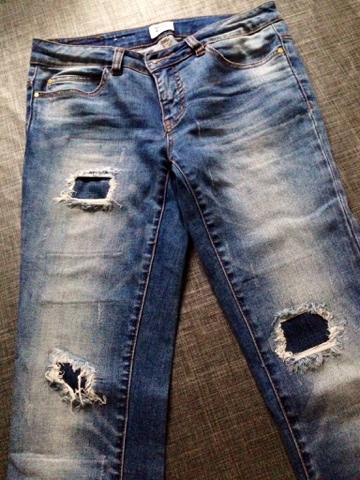 Jeans - Gap Outlet & patches! Haven't knee patches come a long way, I remember my mother putting a neon green 'GO' sign on my right knee when my jeans ripped at the age of 9. I wasn't best impressed! !